An evening with a showband was a mix of musical comedy and cabaret, tourist variety act, vaudeville show and rock and roll dance. The showbands could perform soulful ballads then a satiric skit, make fun of their Māori culture while also educating the audience, while always displaying dazzling virtuosity yet looking spontaneous. The Maori Hi-Five is considered the first true Māori showband: The group exemplified the genre. The seeds of the Maori Hi-Five were sown at a hui in Ruatoki in 1957, when Wanganui teenagers Ike Metekingi and Kawana Pohe – who had their own dance band – met Rob Hemi, a guitarist from Wairarapa, and discussed forming a band. By chance Hemi bumped into Metekingi in Wellington shortly after he had moved there. They put their plans in motion, hiring a multi-instrumentalist and singer from Ruatoria, Solomon Pohatu. They then recruited a Rarotongan percussionist, Fred Tira, and a drummer, Tuki Witika. As the Hi-Five Mambo, they began performing at dances in Wellington. Drilling the musicians like a military operation, they changed the band from a rock and roll combo into a versatile entertainment unit. Two recent immigrants from Britain then played a pivotal role in the creation of the Māori showband phenomenon. Charles Mather was an ex-Royal Marine, and Jim Anderson a former traffic cop. They could see the possibilities in the Hi-Five Mambo’s array of talents, and became their managers. Mather concentrated on the stagecraft, Anderson on the business. Drilling the musicians like a military operation, they changed the band from a rock and roll combo into a versatile entertainment unit. They insisted that the musical items were fast-paced and diverse, and also encouraged the band to bring in comedy routines, kapa haka and showmanship such as choreography. Most of all, Mather and Anderson told the musicians, “Look like you’re enjoying yourselves, and the audience will be entertained.” To make certain, the managers fined the musicians when they didn’t smile enough on stage. Jimmy “Junior” Tuatara was another early member with a gift for comedy, and he would go on to enjoy a career in the UK as “the mad Maori”. Crucial to the revamped Hi-Five was Kawana Pohe, who then joined as a multi-instrumentalist and arranger. Severely sight-impaired since childhood after a kick from a horse, Pohe learnt music at the Blind Institute in Auckland, and was highly regarded as a saxophonist. By 1959 the group was renamed the Maori Hi-Five, and had a residency at Wellington’s Trades Hall dance club. In January 1960 they headed to Australia; by this stage the band’s line-up was Rob Hemi, Solomon Pohatu, Kawana Pohe, Harata Pohe, Wes Epae, Paddy Te Tai, Tuki Witika and drummer Peter M Wolland. During the band’s long career, they shared stages with Duke Ellington, Louis Prima, Eartha Kitt and Harry Belafonte. They played in Sydney first, then on the Gold Coast in Queensland. They were so successful that the local musicians’ union tried to have them banned, but they stayed in Australia for 14 months then left for Britain. More residencies followed, at prestigious venues such as London’s Pigalle restaurant and Embassy Club, and the group made many television appearances and tours of Europe. At this stage they were earning £1000 per week. In 1963 the Maori Hi-Five returned home for a national tour promoted by Kerridge-Odeon. Unfortunately ticket sales were poor, and the reviews were mixed. It is a curiosity of the Māori showband phenomenon that most of their success was overseas: There were many showbands, but only occasionally did any of them return to New Zealand to perform. The Maori Hi-Five would perform around the world until 1970, when several of the members returned to New Zealand. During the band’s long career, they shared stages with Duke Ellington, Louis Prima, Eartha Kitt and Harry Belafonte. A highlight was the Hi-Five’s performance on the same bill as the Beatles, in Hong Kong on 9 June, 1964. 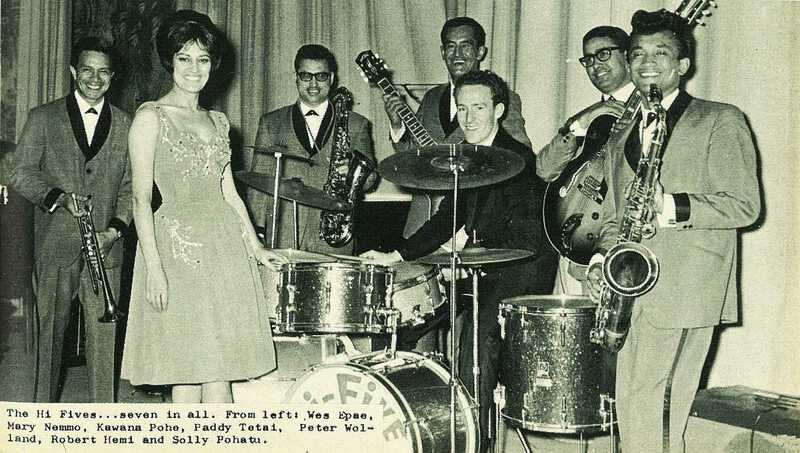 At the peak of the Māori showband phenomenon, in the mid-1960s, Sydney nightclubs featured acts such as the Maori Troubadours, the Maori Hi-Liners, the Quin Tikis, the Maori Volcanics, Te Kiwis, the Premiers, the Maori Hakas and even the Maori Minors. But relatively few of them ever recorded, and those that did usually appeared on Australian record labels. The Maori Hi-Five were the most productive in the studio. Two of their three EPs, Hi-Five Tamoure and The Maori Hi-Five, featured a mix of Māori pop traditionals such as ‘Now Is The Hour’ and ‘Putti Putti’, while Instrumental International saw them interpreting standards such as ‘Caravan’, ‘American Patrol’ and ‘Perfidia’. The band’s four albums are dominated by easy-listening songs popular with the cabaret crowd in the 1950s and early 1960s. The stand-out is probably The Maori Hi-Five, released in 1963 on Leedon, an Australian label. It shows the eclectic set-lists and the virtuosity of the band, from the standards ‘Begin the Beguine’, ‘That Old Black Magic’ and ‘Mack the Knife’ to the slinky R&B groove ‘Send for Me’ (originally cut by Nat King Cole). Sol Pohatu left in 1971, and was replaced by Frankie Stevens. They may have been away from home for almost a decade, working hard, but they also had a lot of fun. Two members of the Maori Hi-Five passed away in 2018: Solly Pohatu and Paddy Te Tai. Leedon was an Australian label owned by American promoter Lee Gordon and Australian rocker Johnny O'Keefe. The Māori Hi-Five recorded three albums for the label, with Serenade In Blue being the first, issued in February 1961. 1958 (Maori) Hi-Five Mambo song list comprised mostly of Latin tunes reflecting the 1950s popularity of groups like Louis Alberto Parana and the Trio Paraguayos. From left: Mary Nimmo, Kawana Pohe, Paddy Te Tai, Peter Wolland, Robert (Hemi) Te Miha, Solly Pohatu and (front) Wes Epae. This photo originally appeared as the cover of the 1963 Maori Hi-Five EP, released on Odeon in Sweden and HMV in New Zealand. The Māori Hi-Five in June 1964 in Hong Kong with The Beatles: Paul McCartney, Wes Epae, John Lennon, Kawana Pohe, Paddy Te Tai, George Harrison, unknown hotel staff (kneeling), Robert Hemi Te Miha, Solly Pohatu and the local agent. Ringo Starr joined the tour later, after having his tonsils removed in London. Wellington, 1958: Costa Christie, left, with original Hi-Five manager Jim Anderson. Later known as "Big Jim" in Sydney's King's Cross, he was an associate of notorious nightclub operator Abe "Mr Sin" Saffron. In 1970 Anderson fatally shot a "standover man" in a Sydney nightclub. In December 1961 in Disc magazine, producer George Martin is quoted as saying "I have just signed an outfit that does sound different – the Maori Hi Fives. I think they’ll be a sensation". Sadly nothing seems to have come of this.